2015, with Mette Louise Berg and Nando Sigona, Ethnography, Diversity and Urban Space, London: Routledge. 2015, with Nazneen Ahmed, Jane Garnett, Alana Harris and Michael Keith, “Shifting markers of identity in East London’s diasporic religious spaces“. Ethnic and Racial Studies 39 (2), pp. 223-242. 2014, “Towards a Cosmopolitan Account of Jewish Socialism: Class, Identity and Immigration in Edwardian London“, Socialist History no.45, pp. 61-79. 2013, “Diasporic Memory and the Call to Identity: Yiddish Migrants in Early Twentieth Century East London“, Journal of Intercultural Studies, 34, 6. Special issue: Refugee and diaspora memories. 2012, with Keith Kahn-Harris, “Contemporary Anglo-Jewish and Community Leadership: Coping with Multiculturalism”, The British Journal of Sociology, 63, 1. 2009, “A note on the awkwardness of the ethnographer”, Sociological Review, 57, 3: Special issue: Post-colonial Bourdieu. 2009, with Marjorie Mayo et al, “Community empowerment and community cohesion: parallel agendas for community building in England?” [.pdf] Journal of Social Intervention: Theory and Practice, 18, 1. 2017, with Scholten, P. and van Breugel, I. (2018) Mainstreaming in practice: the efficiencies and deficiencies of mainstreaming for street-level bureaucrats. In: Scholten, P. and van Breugel, I. (eds.) Mainstreaming Integration Governance: New Trends in Migrant Integration Policies in Europe. London, UK: Palgrave Macmillan, pp. 153-168. 2016, with O. Jensen, ‘”They’ve got their wine bars; we’ve got our pubs”: Housing, diversity and community in two South London neighbourhoods’ in Ferruccio Pastore and Irene Ponzo (eds.) Inter-group Relations and Migrant Integration in European Cities: Changing Neighbourhoods. Berlin: Springer. 2016, with Nasar Meer, “Identity and Community: continuity and change” in Josef Meri (ed) The Routledge Handbook of Muslim-Jewish Relations, .outledge Handbooks in Religion. London, UK and New York, U.S.: Routledge, pp. 235-251. 2015, “Speaking of the Working class” in Bridget Anderson, Vanessa Hughes (eds) Citizenship and its Others. London: Palgrave. 2015, “Cultures of translation: East London, diaspora space and an imagined cosmopolitan tradition” in Nando Sigona et al (eds.) Diasporas Reimagined: Spaces, Practices and Belonging, Oxford: Oxford Diasporas Programme. 2014, “Sociology”, in Valman, N. and Roth, L. (eds. ), The Routledge Handbook of Contemporary Jewish Cultures, London: Routledge, pp.60-70. 2012, With Mick Gidley, Catalogue essay, Another London: International Photographers Capture City Life 1930-1980, Tate Britain. 2012, “Monitoring Integration in the UK” in Rob Bijl and Arjen Verweij, eds, Measuring and Monitoring Immigrant Integration in Europe: Integration Policies and Monitoring Efforts in 17 European Countries. Amsterdam: SCP. 2011, With Keith Kahn-Harris, “From Security to Insecurity: British Jewish Communal Leadership in the Context of Multiculturalism” in Harvey E. Goldberg et al, eds, Dynamic Belonging: Contemporary Jewish Collective Identities, New York: Bergahn. 2009, “Ghosts of Kishinev in the East End” in Nadia Valman and Eitan Bar-Yosef, eds, The ‘Jew’ in Late-Victorian and Edwardian Culture: Between the East End and East Africa. London: Palgrave. 2008, “Deptford? Regeneration?” [.pdf] in Adnan Hadzi, ed, Deptford.TV diaries II – Pirate Strategies. London: OpenMute. 2007, “Youth Culture and Ethnicity: Emerging Youth Multiculture in South London” in Paul Hodkinson and Wolfgang Deicke, eds, Youth Cultures: Scenes, Subcultures and Tribes. London: Routledge Advances in Sociology series, pp.145-160. (Hardback and paperback editions). 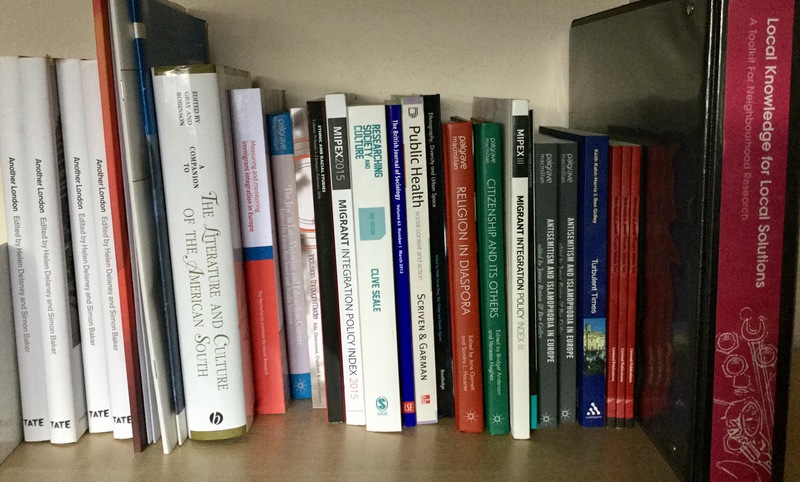 2007, “Sure Start: an upstream approach to reducing health inequalities?” in Angela Scriven and Sebastian Garman, eds, Public Health: Social context and action, Buckingham: Open University Press, pp.144-153 (Hardback and paperback editions). 2018, with Steve Hanson and Sundas Ali Identity, Belonging & Citzenship in Urban Britain London: CUCR. 2016, Cohesion and Belonging: Lessons Learned Report. Oxford: COMPAS. 2015, 50 Days in the Summer: Gaza, political protest and antisemitism in the UK. London: All-Party Parliamentary Group Against Antisemitism. 2015, with Ole Jenson, UPSTREAM: The Politics of Mainstreaming Immigrant Integration Policies. Case study of the United Kingdom. Rotterdam: Upstream. 2014, with Sundas Ali, Advancing Outcomes for All Minorities: Experiences of Mainstreaming Immigrant Integration Policy in the United Kingdom. Brussels: MPI Europe. 2014, with David Feldman, Integration Disadvantage and Extremism. London: Pears Institute for the All-Party Parliamentary Group Against Antisemitism. 2013, With Maria Luisa Caputo, Residential Integration – Towards A Sending Country Perspective. Florence: INTERACT. 2013, with Irene Ponzo, Researching Functioning Policy Practices in Local Integration in Europe: A Conceptual and Methodological Discussion Paper. Turin: ILO-ITC. 2012, with Liz Collett, Attitudes to Migrants, Communication And Local Leadership: Final Transnational Report. Oxford: COMPAS. 2012, with Ole Jensen, Diversity, Cohesion and Change in Two South London Neighbourhoods. Oxford: COMPAS. 2012, with Alessio Cangiano, Zoe Khor, Dina Kiwan, Citizenship and Integration in the UK. Oxford: COMPAS. 2010, with Hiranthi Jayaweera, An Evidence Base on Migration and Integration in London. London: GLA. 2008, with Geraldine Blake, John Diamond, Jane Foot, Marjorie Mayo, Kalbir Shukra, Martin Yarnit, Community engagement and community cohesion, Joseph Rowntree Foundation, June 2008. ISBN 9781859356609. Full report (PDF format – 285KB). Summary Findings (PDF format – 99KB). 2008, with Alison Rooke. Learning from the Local: The Newtown Neighbourhood Final Report [.pdf]. London: Goldsmiths. 2007, with Kerry Chappell, Knowledge East Creative Impact Matrix: Connecting the Arts & Regeneration – The Story so Far [.pdf], TrinityLaban. 2005, with Tim Crabbe, Imogen Slater et al, Knowing the Score – Positive Futures National Case Study Research, Substance/Home Office. 2017, “Why Are U.K. Progressives Still Celebrating a Grotesque anti-Semite and Holocaust Denier?” Ha’aretz, October 28. 2016, “Who is Allowed to be Human? ‘Bare Life’ in Aleppo and on the Mediterranean“, Wildcat Dispatches, December. 2016, with David Feldman, “Social justice must be at the heart of a renewed strategy for integration and cohesion“, Birkbeck Comments, December. 2015, “Multiculturalismo: pros y contras del sistema británico de integración no regulada”, Vanguardia Dossier Nº 58: El futuro del Reino Unido, April/June. 2015, “It’s time to put integration back on the agenda“, LeftFootForward, June. 2015, “The UK tumbles out of top ten in key immigration ranking“, The Conversation, June. 2015, “An evidence base for a rights-based approach to migrant integration policy“, MRN Migration Pulse, June. 2013, “Calm hysteria and assess the real local impact of migration”, The Conversation. 2012, “Becoming British” Britain in 2012 ESRC. 2012, “The stalled lives of young migrants“, OpenDemocracy. 2011, “The Politics of Defining Racism: The Case of Anti-Semitism in the University and College Union“, Dissent. 2011, “London Enriched: The research behind the report“, Ben Gidley, Migration Pulse blog, Migrants’ Rights Network. 2011, “British Jews and Muslims: two myths” (Part 1), Ben Gidley, Muslim Institute blog (part 2). 2011, with Hiranthi Jayaweera, “Living Together“, The New Londoners. 2010, “The left, social theory and terror“, Dissent. 2010, “On Brick Lane: Are Jews the Model Immigrants?“, Dissent. 2010, “On Irony and Forgiveness“, Dissent. 2010, “Who Are the English Defence League? And Are They Fascist?“, Dissent. 2010, “Israel and the British Left“, Dissent. 2008, “The Last Resistance” [.pdf] Democratiya, vol.14 (p.44-57). 2008, “Full Marx” [.pdf, on Rick Kuhn’s Henryk Grossman and the recovery of Marxism] Jewish Socialist 56, Autumn 2008, (pp. 28-29). 2008, “Lewisham ’77” Street Signs, Spring issue [.pdf] (pp.5-7). 2004, “Local knowledge for local solutions” ARVAC Bulletin 93 (pp.1-3). 2004, “Zygmunt Bauman’s City” Street Signs, Vol. 1, Issue 6 [.pdf] (pp.22-23). 2003, “Passages Through Dark Times” Street Signs, Vol. 1, Issue 5 [.pdf] (pp.18-19). 2002, “Angels, Fragments and Ruins in London’s East End” [.pdf] in Stephen Dobson, ed, The Urban Pedagogy of Walter Benjamin. Lessons for the 21st Century Part III CUCR Occasional Paper, London: Goldsmiths. 2002, “Tragedy of Middle East is nationalism in all its forms” Reuters AlertNet. 2000, The Proletarian Other: Charles Booth and the Politics of Representation [.pdf]. CUCR Occasional Paper. London: Goldsmiths. 2000, “Lines of Dissent: East End Radicals” in Jewish Socialist #41 Spring 2000 (pp.24-25). Gefilte fish and syndicalism [mp3], Podcast of talk at JSG commemoration of the hnudredth anniversary of the tailors’ and dockers’ strikes of 1912, via Resonance FM Circled A.